Take a glimpse into 1st Page 2000 and see why it makes HTML coding a breeze. 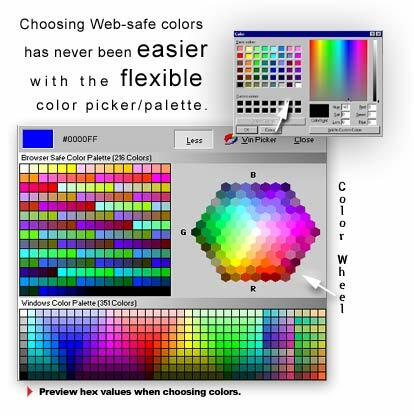 1st Page 2000 allows users to quickly and easily choose custom colors in 4 ways. Colors can be choosen from the default windows color picker, a complete web-safe color wheel, a 216 web-safe color palette and even a complete windows color palette of 351 colors. The 4 way color selection gives absolute color management to web builders. Edit mode lets you see and hand-write html code into your webpage with 100% HTML Source preservation. Split screen mode lets you hand-write your webpage and view the rendered page in realtime with the integrated Internet Explorertm engine. 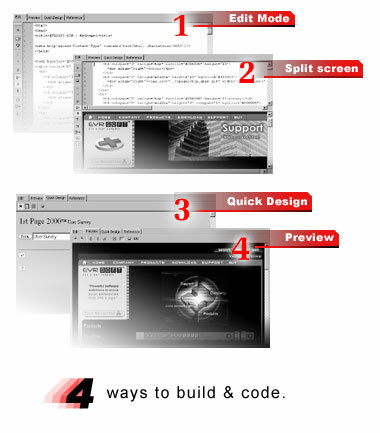 Preview mode lets you quickly preview your webpage internally with Internet Explorer. This time saving mode saves you time from having to launch an external copy of different browsers and switching to and from applications when previewing. You can switch to Preview mode by simply hitting the "F12" shortcut key.